April 27, 2015 (Jamul)--CAL FIRE in conjunction with the California Department of Fish and Wildlife will be conducting live firefighting training and habitat improvement in the Rancho Jamul Area. This vegetation management project will also include the burning of non-native grasses. The training is scheduled to begin on Tuesday morning, April 27 and last through Friday afternoon, April 30th if weather permits. Several fire crews will be present while burning is conducted. November 23, 2014 (Jamul) – A motorcycle fire caused a brush fire that burned approximately one acre today at Pio Pico Thousand Trails in Jamul on Otay Lakes Road. September 28, 2012 (San Diego’s East County) – Cal-Fire reports that a 4-acre grass fire off Matthew Court in Ramona has been halted, with no damage to structures. 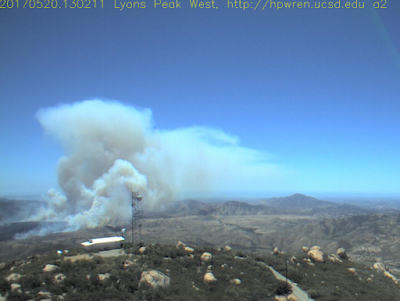 In addition, the Skyline Fire in Jamul has been stopped at a quarter of an acre west of Lyons Valley Road and Mountain Valley Road. July 25, 2012 (Jamul)-- A brush fire that began at or near 128480 Proctor Valley Road in Jamul shortly after 4 p.m. was knocked down by a massive, multiple agency response that included over 100 firefighters from at least a half dozen fire departments. Update 5:20 p.m.: The fire's forward spread has been stopped at 20 acres, Cal Fire's Roxanne Provaznik reports. No structures were burned. Proctor Valley Road remains closed between Chula Vista and Jamul. Echo Way is also closed but should be opened soon. Update: This fire was stopped at two acres; cause remains under investigation per Cal-Fire, the Deerhorn Valley Antler reports. July 1, 2012 (San Diego’s East County) – Cal-Fire has stopped the forward spread of a two-acre brush fire that started in the 14000 block of Otay Lakes Road near the Thousand Trails Campground at Pio Pico. No structures were threatened by the blaze, which IPN reported at 2:18 p.m. Cal-Fire halted the forward spread of the slow-burning fire at 2:57 p.m.
June 20, 2012 (Jamul)-- The fire that started this afternoon around the Thousand Trails Campground damaged no structures, and burned about 30 acres. According to Mike Mohler, Public Information Officer for Cal Fire, it was "wind driven, with light fuel." Early reports mistakenly informed media that the fire started in a structure, based on a caller who reported the fire and believed it to be in a structure. Update 4:05 p.m. - Forward spread of the fire has been halted, says Roxanne Provaznik at Cal Fire. Update 3:40 p.m. -- Firefighters are making good progress toward containment, Cal Fire reports. Two air tankers have been dismissed. December 17, 2010 (Jamul) 11:14 p.m. – A vehicle fire has spread into brush, sparking evacuation of a trailer park at 13800 Lyons Valley Road in Spring Valley, Incident Page Network reports. A rollover accident with a vehicle ending up in a ditch triggered the blaze, which was reported at 10:22 p.m., according to the California Highway Patrol. Update 3:02 p.m. -- Forward spread of this fire has been stopped; firefighters remain on scene mopping up hot spots. September 5, 2010 (Deerhorn Valley) 2:40 p.m. – A roll-over accident at the 14 mile marker on Honey Springs Road north of Highway 94 has started a brush fire that is now 20 acres near the Deerhorn Valley Community. August 11, 2010 (Jamul) – San Miguel Fire and Sycuan firefighting crews responded to a structure fire off Highway 94 and Vista San Diego in Jamul this afternoon. Upon arrival, crews found the roof in flames and made an aggressive attack. May 12, 2010 (Jamul) – A small brush fire on the 13th hole of Cottonwood Golf Course on Willows Road near Jamul was swiftly extinguished by Cal-Fire and the San Miguel Fire Department. September 20, 2009 (Jamul) 5:45 p.m. -- A brush fire that started around 5:30 p.m. today has burned approximately one acre at Highway 94 near Jefferson in Jamul, CAL-FIRE Battalion Chief Nick Schuler has informed East County Magazine. This is the second brush fire in two days for the area. August 28, 2009 (San Diego’s East County) – A brush fire in Jamul has caused a power outage in the vicinity. The fire, caused by a traffic accident, has been contained at ¾ an acre, CAL-FIRE spokesperson Roxanne Provaznik reports.